"Females are rewarded more when we experience ourselves and act as though we are flawed, insecure, or especially dependent and needy." 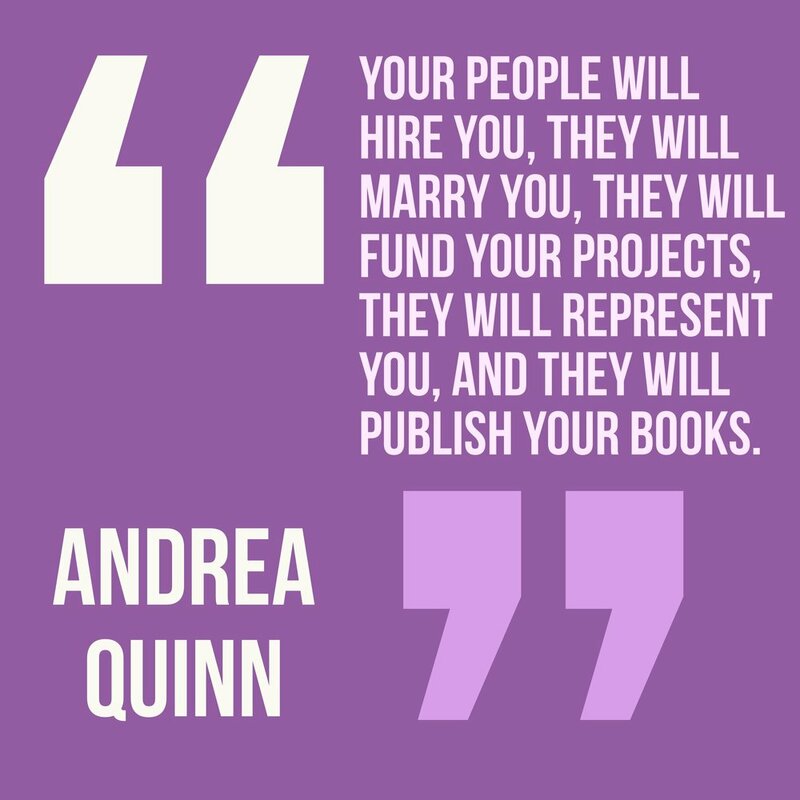 Enter Andrea Quinn, an empowerment coach who has transformed thousands of lives across the nation, including here in Hollywood—with her Quinn Essentials curriculum through which she teaches nine powerful tools in workshops for women, and even for big corporations. Many of the problems women experience, Quinn tells Beyond The Interview, start from SELF-JUDGMENT. Comparison, for example, is self-judgment. People are so hard on themselves—especially women—that they take that negative internal monologue and begin to project it out into the world. Unfortunately for society, women (and men) are now comparing themselves even more so, especially owing to a virtual reality—like Instagram posts. "A lot of people begin to feel jealous of people, and envious," Quinn says. "A lot of people don't like people that are confident because it makes them feel uncomfortable, because they're not." ...It is rooted in the same fairytale logic that teaches us that only one female can win the day or be chosen. Women do have a hard time with one another—that is until, Quinn says, they really get the value of other women—and that's one reason why her groups are so successful. Women ranging from their 20s to 70s take Quinn's workshop. Research shows that younger women have a harder time dealing with each other, and it is often fueled by the quest for a man or for a job—as if it's a zero-sum game—that propels deep levels of insecurity in women, and a distaste for one another. In The Atlantic, one writer devotes the entirety of her research to answer one question: Why do women bully each other at work? "Half the people you don't like, you don't really even know." And the insecurity? Where does that come from? "I think women learn to be insecure because they've had to struggle to find their voice in the world. They don't want things taken from them," the life coach says. "But the only way to change is to work on understanding the value of other women around them. Then, they can work on self-esteem and self-respect and self-honor and self-dignity." Gretchen Rubin, author of The Happiness Project, also emphasizes the importance of eliminating jealousy in order to be happy. But how do we tackle jealousy when it creeps up on us? Quinn has a solution for this, too. "I always tell my clients—when someone has something we want, that they’ve given us permission to go for it. "You have to remind yourself: If they can do it—you can do it," Quinn says. "Anybody can have whatever they want. It's their own limited beliefs that prevent people from having what they want." In other words, if you want a really amazing life, you have to look at your gifts. “And then you must accept your gifts, and if you don't know what you're good at? That's your job to find out." The profound problems is when women don't know what their gifts are. "What women do know—is know all the places they come up short. Every place they're not, and everything they don't have, and everything they think that if they fix it, they'll be better, and that's simply not true." What's wrong with you is simply none of your business, according to Quinn. So, you have to ask yourself: What's right about you? Why do people love you? And as you expand that more and more and more, your life will be indicative of that thought process. Quinn tells BTI that unfulfilled expectations can also affect women, especially in this digital age. "You see what looks like the perfect couple doing the perfect thing, and you turn to your mate, and say, 'How come we don't look like this? How come we're not doing this?' And the truth is, most of these Instagram and Facebook posts are an illusion anyway." In Los Angeles, where she lives, Quinn identifies an even bigger problem. "The culture of Los Angeles can be very showy," she says. "Bigger is better—more is better. It's Hollywood. It's about wanting the best, being the best, being the most popular, having the most. And that puts a lot of pressure on people." Another source of pressure for women can come from remaining single for long periods of time. True. But the title seems to celebrate and encourage being single over being in a relationship. "Here's what I know," Quinn tells us. "Traditional marriage, I understand isn't for everyone—but what I know about humans, is that they need other human beings. We need relationships, and we need people. And there are studies that show isolation equals depression. With the way technology is today, people can have 6600 friends on Facebook and be the loneliest person in town." Quinn says people also need family and community in order to thrive. But what kind of community? Quinn says that if you acknowledge who and what you are, and you can’t identify your core characteristics and values in other people, that relationship probably won’t work. They’re not bad if they’re not your people. “If they’re not your people, you’re not their people. Game over. There is no ego involved. Not everybody is everybody’s people,” Quinn says. Women have wasted too much of their lives trying to make ‘not their people,’ their people. Your job is to find YOUR PEOPLE. Your people will hire you, they will marry you, they will fund your projects, they will represent you, and they will publish your books. But there ARE challenges in identifying your people, and getting rid of those who are not your people. For example, communities and families alike can put a lot of pressure on their members to conform to their beliefs, ideals, and values in order to save face and remain a part of the tribe. And we are doing better. We are reading more self-help books. We are attending seminars. We have female researchers and leaders like Gabrielle Bernstein, Esther Perel, Marie Forleo, Danielle LaPorte, and Brené Brown, who are teaching women invaluable lessons across the board. All of the effort we put into working on ourselves is not going unnoticed. Quinn says it is relatively easy to help both women and men change their perspectives, once they are open to it. “A lot of actors and actresses, for example, will tell me something like ‘my friend got the part and she doesn’t even have a resume.’ And I say ‘GOOD! That just tells you that the networks are hiring people without resumes! This is awesome news!’” This perspective is taught over and over again in Quinn’s workshops. And it’s true, because women do have so much power, and talent, and empathy, and skill. So what do we need to change here? "Women often give their power away. We want them to like us, we want them to marry us, we want them to not judge us, so we feel like we have to sacrifice something." Self-acceptance is: “this is where I’m magnificent, and I can own it. And I don’t have to feel bad about it, and I don’t have to feel bad that YOU feel bad about it”—alluding to the apologetic nature we have adopted as women when we display self-confidence. And what exactly does an unbalanced female feel like? We are, according to Quinn, headed in the right direction, though. According to Quinn, the consciousness and awareness can also help us think more globally. Everything you’re doing is here to help the world, she says. So where are you going to make a contribution? Next month will be the 10-year anniversary of Quinn’s empowerment classes. She has been a one-on-one life-coach for 12 years.